More than 40 years after the premiere of UC San Diego composer Roger Reynolds innovative intermedia work PING, the piece has been restored and updated with new technologies. The composition combines flute, piano, percussion, harmonium, live electronics, and projected moving and still images. 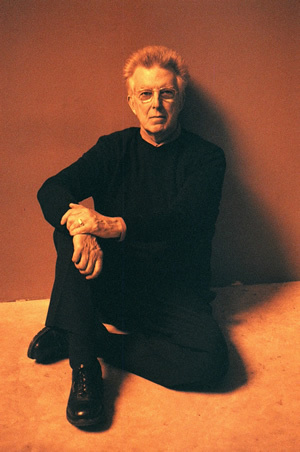 The new version of Reynolds’ 1968 work for flute, piano, percussion, harmonium, live electronics, and projected moving and still images was performed May 27 at UCSD’s Conrad Prebys Music Center. “Ping Migration,” an exhibit dedicated to the piece, will be on view through June 10 in the Geisel Library’s ground-floor Arts Library. PING was named for Samuel Beckett’s short story of the same title. Beckett’s text was projected using a series of slides produced by Reynolds’ wife Karen, a musician and typographical designer. The text was not spoken or sung. Reynolds collaborated with several other important artists including Beckett, Akaji Maro (butoh dancer), and Kazuro Kato (cinematography). Kato had worked with famed Japanese director Akira Kurosawa and was recommended to Reynolds by fellow composer Toru Takemitsu. At the heart of PING was a short 16mm film scripted, scored and directed by Reynolds, featuring images of Maro. The film has been restored by UCSD music alumnus and MFA student Ross Karre with assistance from The UCSD Libraries. Karre also produced a new documentary “Ping Migration,” about the process of restoring the original work. Reynolds collaborated with UCSD music Ph.D. student Paul Hembree to add digitally-generated sounds to PING’s original score. PING premiered in Tokyo at Takemitsu's "Orchestral Space '68” festival. 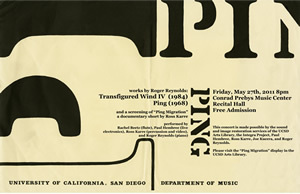 It was performed at UCSD the same year (when Reynolds was a Regents Lecturer) as part of a national tour, alongside works by then-UCSD music faculty member Pauline Oliveros; and repeated in a Japanese-English version for a crowd of 3,500 at the CROSS TALK INTERMEDIA Festival in Japan in 1969 together with compositions by Robert Ashley, Salvatore Martirano, Gordon Mumma, Takemitsu, and Joji Yuasa. In the 43 years since PING’s debut, technology, performance practice, intermedia collaboration methods, and Reynolds' own aesthetic foundation have changed in fascinating ways, as documented in the library exhibit and Karre’s film. Some changes were so profound (such as the decay of the original 16mm film print) that they had prohibited the piece from performance. Now, the process of migrating the piece to new digital media has given it new life and opened doors to new additions which were planned for the original but never realized. The UCSD Libraries are working with Reynolds and Karre to digitize PING excerpts and creative materials for the library’s Digital Library Collections website. The materials include compositional sketches and diagrams, films, interviews with Reynolds, and photographs from both the 1968 UCSD performance and a recent recording session. The “Ping Migration” exhibit illustrates the evolution of cutting-edge music at UCSD through five decades and provides visitors with the opportunity to see how the work of contemporary composers has evolved beyond earlier traditions.